Have you ever wondered how to get your handbags in magazines, how to brand yourself? Today everything is social media, but believe it or not people still read newspapers and magazines, that’s why they still sell them! Here is something else to consider, every magazine has an online edition! Have you every wondered who picks those bags in a magazine or the online additions and how? Well it’s the same person who picks the fashion for T.V shows, movies and the fashion pages of your local newspapers…it’s the stylist! Stylist will go to sale reps showrooms and view what’s new in the marketplace. Their job is to find new emerging styles, trends and new designers, including handbag designers! Did you know that if you look inside your favorite fashion magazine on the first page they tell you who the stylist is? Did you know they also have their contact info? Did you also know that they will look at your work? Guess what if they like it, you can end up on the cover? Here is proof! All the press we had came from either reps or sending pictures to the stylist! 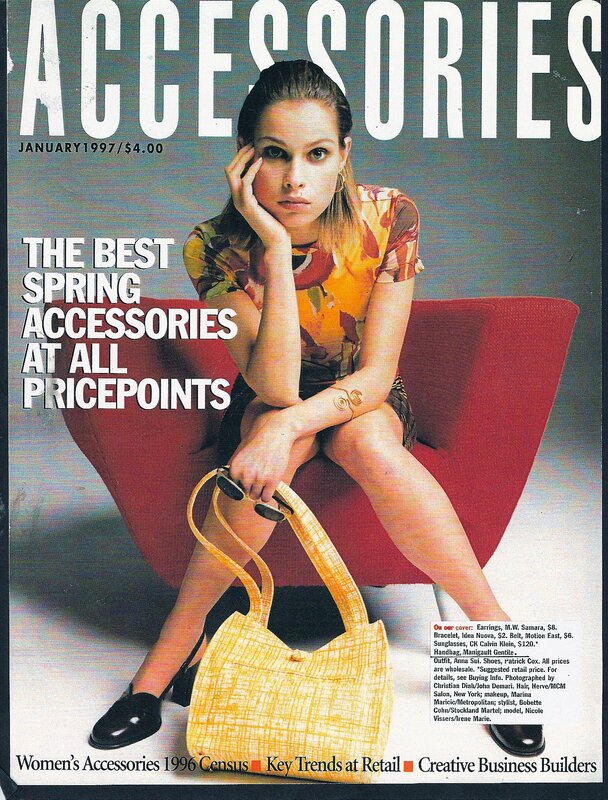 Those bags appeared in magazines from McCall’s to Moda and newspapers across the country. It really boils down to what you want to accomplish. While people can make a comfortable living selling online, that’s not branding. Branding is about your work and company being around long after you are gone. Designers have a window of creativity, the ability to stay relevant doesn’t last forever, the taste in each generation changes, to keep up great designers look for younger great designers, they called them design houses. Like Gucci, Chanel, Louie Vitton, Hermes and Coach are all design houses. By putting their name on new designers they stay relevant and expensive and live 100-150 years in the future. You can’t do that on the internet, you need someone famous or you need tradition marketing to carry you to the next level. Why can’t you? There are simply too many people selling bags on the internet and it’s hard to find the pony, the star, the next big thing, the fashion forward. Your marketing has to stand out, just like your designs and fabrication to build a brand. It’s better to lead the herd then to follow the herd, less dirt get’s in your eyes. Branding is far different then just selling bags.